After Evangelicalism is written by Canadian historian Kevin N. Flatt, an expert on secularization and religious change in the twentieth century, particularly in Canadian history. He is the Associate Professor of History at Redeemer University College in Ancaster, Ontario, where he is also the Director of Faculty Research. 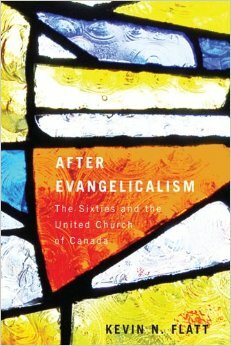 In After Evangelicalism, Kevin Flatt argues that the United Church’s abandonment of its evangelical identity was rooted in a long-standing disparity between the church’s clergy, who generally held modernist beliefs, and the laity, who were generally evangelical in belief. In the 1960s, Flatt contends, the rising tensions created by this disparity broke in tandem with a convergence of internal and external cultural shifts that resulted in the wholesale dismantling of the United Church’s evangelical identity and the creation of a new theologically liberal identity that located the United Church firmly outside the bounds of evangelicalism. In Chapter One and Two, Flatt arguess that beginning in the early 1930s, in response to factors like the Depression, the threat of totalitarian ideology abroad, and competition from the “sects,” the church’s leadership established a strategy that sought the transformation of society through the promotion of evangelical practices such as revival evangelism, Christian education, and moral reform programs. Flatt terms this strategy “loud evangelicalism,” which concealed the modernist beliefs of the church’s leadership, or what Flatt labels “quiet modernism,” whilst reinforcing a strong evangelical identity for the United Church up until the 1960s. In the following chapters, Flatt demonstrates how the public expression of the church leadership’s modernist beliefs, in the 1960s, converged with cultural and theological revolutions resulting in a new liberal theological identity. The leadership’s modernist beliefs were publicly expressed through the publication of the New Curriculum which had been intended to bridge the gap between clergy and laity. Soon after the curriculum’s release, the United Church made it clear that it officially rejected the authority of Scripture and the role of traditional creeds. In addition, the church advanced a new understanding of mission by promoting a “New Evangelism” that redefined evangelism to mean social action, sought to change the church rather than the world, and jettisoned conversionism altogether. All these changes resulted in a liberal theological identity that was very much at odds with the evangelicalism of the United Church’s forebears. The creation of the United Church Renewal Fellowship, an evangelical voice of dissent, confirmed this new liberal identity. Flatt concludes that the numerical decline the United Church has experienced since the 1960s was the result of the church’s embrace, now possible through its new identity, of wider cultural trends. According to Flatt, numerical decline and the cultural shifts were mutually reinforcing processes that underpinned the collapse of mainline Protestant influence in Canada. Scholarly opinion has been divided regarding how and when evangelical theology was supplanted by liberal modernist theology in the mainline churches.1 Flatt blends aspects of these two interpretations into a compelling argument with excellent scholarship. However, Flatt does evince a rather critical bias against the United Church, himself hailing from an evangelical background. He sees the redefinition of the United Church’s identity outside of evangelicalism as an obvious break from the evangelical heritage of that church’s forebears. This is rather different than Phyllis Airhart’s portrait of the same events in the United Church.2 She sees the new identity as a sort of evolution; she herself comes from the United Church. They tell the same stories but from different angles, one from within and the other from without. Though the book displays very strong scholarship, there is at least one weakness, which has been pointed out by Bruce Douville in his review of the book.3 Douville points out that Flatt’s argument is largely predicated upon a sharp dichotomy between the categories of “modernist” and “evangelical.” This cannot account for church officials who maintained elements of both modernist and evangelical theology. Despite this weakness, After Evangelicalism is a contemporary, scholarly work that has provided an innovative and original interpretation of the United Church’s discarding of its evangelical identity in an academic discussion that had previously been polarized by two schools of thought. This book should be read by anyone who is interested in Canadian religious history.